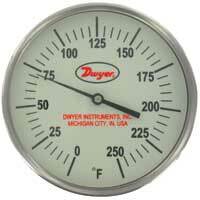 Dial thermometer indicators for temperature. The different models include surface mount, bimetal, pipe-mount, clip-on, panel mount, and remote reading. Applications include tank and vessel monitoring, sanitary process applications, HVAC, and non-intrusive measurement. 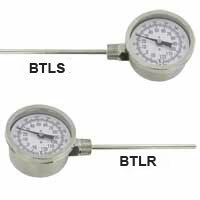 Bimetal Thermometer is accurate and reliable even in tough environments. Applications include chiller or boiler water temperature monitoring and treatment plant temperature monitoring. 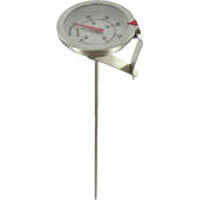 Surface Mount Thermometer easily mounts to and measures the temperature of any ferrous surface. A few applications include manifolds, boilers, air ducts, drums, piping, enclosures, cabinets, and motors. Hot Water Thermometer applies to hot water applications. Other applications include heating coils, hydronic radiant in floor systems, and outdoor wood furnaces. 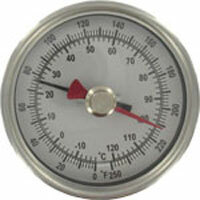 Sanitary Bimetal Thermometer provides accurate measurements. Available in various stem lengths, clamp sizes, and temperature ranges to meet most standard applications. Ideal for sanitary process applications. 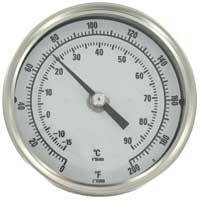 Side Reading Bimetal Thermometer is good in tight, compact areas. Allows quick and easy measurements. Application in tank and vessel monitoring. Long Reach Bimetal Thermometer has a gripping handle which allows comfortability when holding the thermometer during temporary installations. 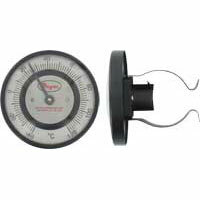 3 Spring Sizes, Fits Pipe Sizes from 3/4" to 6"
Pipe-Mount Bimetal Surface Thermometer is designed to accurately measure the surface of a pipe. Applications in HVAC and non-intrusive measurement. 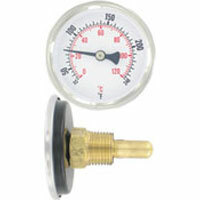 Panel Mount Bimetal Stem Thermometer is designed to easily mount in most instrument panels. Ideal for HVAC, automotive, food industry applications, chemical operations, and many more. 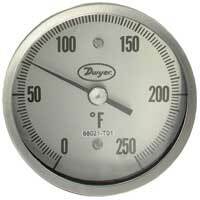 Clip-On Bimetal Thermometer is designed to monitor the temperature of products while cooking in pots, kettles, or other food preparation equipment. 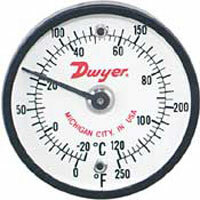 Glow-in-the-Dark Bimetal Thermometer is accurate and reliable even in dimly-lit areas. Can be ordered in various stem lengths, connections, and ranges to fit most applications. 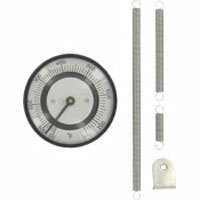 Maximum/Minimum Bimetal Thermometer measures current temperature along with a maximum read or minimum read temperatures. Available in multiple ranges and stem lengths. 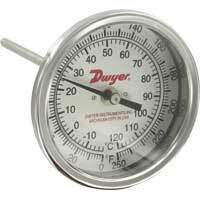 Psychrometers are used for handheld humidity metering. Slide charts are an easy way to check pitot tubes. 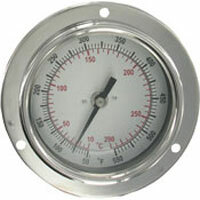 Pipe-Mount Bimetal Surface Thermometer measures a pipe surface temperature. Available in 3 different clip sizes. Applications in HVAC and non-intrusive temperature measurement. 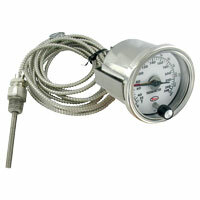 Remote Reading Thermometer with Switch combines a dual scale thermometer and a SPDT relay. Includes a u-clamp mounting bracket for panel mounting. An application is boiler or chiller control.